Consists of car chassis, part of the mixing tube, transmission, water supply installations. Due to technical bottlenecks, domestic mixer’s four pieces are all imported parts. Mixer: the two types of chassis, powertrain, hydraulic systems, racks, mixing tank, out equipment, water systems, steering system, ladder and other components. Mixing tank front and reducer coupling mounted in a rack before the stage, the back-end through raceways supported by two mounted in the rack back riding wheel. 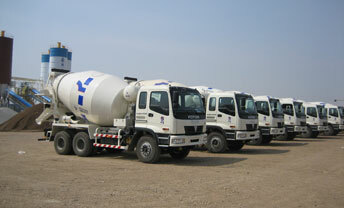 Small cement mixer is also known as mini concrete mixers, concrete mixing mainly for cement transportation work station. Small cement mixer mainly dedicated accessories, including power take off, after mixing tube frame, gearbox, hydraulic systems, the mixing tube, steering mechanism, cleaning systems. Works through the power take off power to remove the vehicle chassis and drives the hydraulic pump hydraulic system, the mechanical energy into hydraulic energy to pass hydraulic motors, gear motors and then driven by gear-driven mixing system, to carry out concrete stir. 6, good vibration resistance, vibration of the rotary shaft, and the yaw axis of the deflection is not sensitive to the sealed chamber.